It’s easy for everyone to get wrapped up in the new, shiny services that the transformation programme has brought. Don’t get me wrong: I think we need to celebrate them, because they’re great. The Carer’s Allowance exemplar cut out 170 unnecessary questions, half of the previous total. The Employment Tribunals exemplar took a 29 page application and made it into a slick 12-step online service. Nobody said it would be easy. But it’s really the people who make transformation of government happen. This thought keeps coming back to me as I’ve been travelling around the country visiting the different exemplars, and it struck me again when I visited the team making the Redundancy payments exemplar at the Insolvency Service in Birmingham a while ago. The Redundancy payments exemplar is in two parts. The first part of it is called RP1, which is where people who have lost their jobs will apply for Redundancy payments. The second part of the service, RP2, is for matching people’s records with the ones that their previous employers have. Parts of the Redundancy payments exemplar passed its Service Assessment in December 2014, which puts RP2 (the second part of the service) in public beta. The first part of the service, RP1, passed its service assessment by the end of February 2015. An impressive achievement, especially as service manager Giles Ecart and transformation manager Jane Fallon told me it was the first time many of the members of the team, including product manager Elizabeth Bird, had worked in an agile way and actually built a service from the beginning. One of the real challenges we’ve been working on with the transformation of digital government is in bringing digital skills into government. This doesn’t just mean hiring talented and skilled people - it also means encouraging them to work in an agile way. And it means having people work on projects that are more complex than others they’ve done before, with support from GDS if they need it. Being made redundant is hard for everyone. But it’s especially tough for people who have lost their jobs because their employers have gone bust. Dealing with a liquidation is more often than not a long, drawn out process. If you’re a former employee, you form part of the queue to get paid, alongside all the other creditors. But what if you need to get paid quickly? The Redundancy payments service gives former employees a way to access their payments as soon as possible. As soon as you know you’ve lost your job, you can apply for redundancy payment, as well as any other payments you might be owed. People who have been made redundant can also get compensation for not having received notice that they were going to be made redundant. That means that part of what the Redundancy payments service does is process claims from employees for something called statutory redundancy pay, which is paid from the National Insurance Fund, but it’s a complicated process. 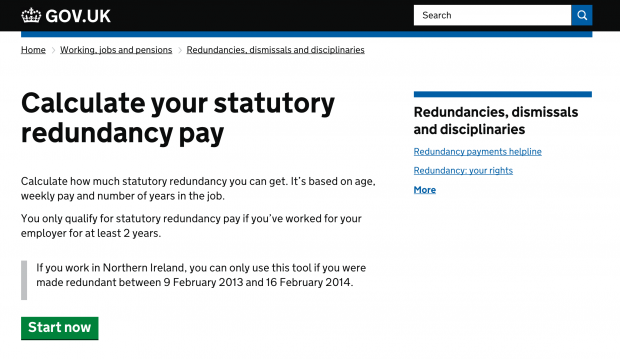 (Employees can also calculate how much redundancy payment they are entitled to using a tool on GOV.UK.) About 100,000 people each year apply for redundancy payments. Before we started the exemplar, applying for redundancy payments was an offline process, involving long forms full of complicated language. Some were up to 14 pages long. They then needed to be optically read, which costs more and adds more opportunity for error. It was also unnecessarily draining work for the people dealing with the forms. We design to meet user needs, not government needs. That’s why we’ve done lots of user research about how people apply for redundancy payments. It’s a highly emotional situation for a lot of our users. Think about it: the company they work for has gone bust, they find themselves without a job through no fault of their own, and they want the money they have a right to. The least we can do is make sure the service works for them, and luckily about 80% of users have relatively straightforward needs from the service. The team had to quickly build a picture of those users needs. The Redundancy payments service had relatively little contact with users until they submitted their paper form. Now they were designing a digital service people would start using the minute they are told they have lost their job. What struck me most with this team is how quickly they got to grips with the rigour of two weekly cycles of user research, and crucially taking on board that feedback. Sometimes just really basic stuff. We realised that a lot of users, especially those who aren’t very confident using the internet, feel more comfortable using the service if they’re told up front what documents they need to supply through the application. The team of developers quickly learnt not just how to built a digital service, but how to design a secure service. Andy Price, a developer, explained how the service would be using GOV.UK Verify, so only real applicants can make claims. Similarly, he mentioned that we know that some people will be using libraries and other shared computers to file their applications for redundancy payments, so keeping it as secure as possible is really important. Also, about 40% of these users are filling out the forms on their phones, so the design needs to work well on a small screen. The team have also worked closely with the liquidators (also called insolvency practitioners). They’re the people who go in when an employer goes bust. They are usually left to tell employees that they’ve lost their jobs. That makes them the people who will be telling people about the service. Many insolvency practitioners provide a lot of support to users, even going so far as helping users complete their applications. They’ve been a fantastic source of insights and feedback for the team working on the exemplar. Working with one or two, the team at Redundancy payments were able to put the service out in a private ‘smaller’ beta. That’s one of the things I mean when I say that it’s people who make transformation happen. Real users, in real situations, driving iterations in design, to make things better. Insolvency practitioners also use the service themselves, providing a lot of the additional information needed to validate a claim. Even though the team have started off by focusing on the aspects of the service that employees use, they’re working on improving the part aimed at insolvency practitioners too. It’s a tricky job, with a lot of complicated legislation, but I’m excited to see what they do with it. For me, it’s a no brainer, brilliant to do online rather than on paper. When there’s money involved it’s quicker to do it online. You get an acknowledgement straight away but with post you wouldn’t have. Can’t remember too much about it, which is a good thing. Painless process. That’s what we’re here to make. People rarely choose to interact with government. In most cases, particularly regarding redundancy, it’s something they have to do, and at a difficult time in their lives. The least we can do is make sure that it’s easy to use. Sometimes the laws and processes involved are really complicated. As I said, we always knew it wouldn’t be easy. But having the right people on the ground, bringing digital skills back into government and by listening to our users, we can begin to change things. The exemplar programme is the beginning of transforming government - and it’s people who make that change.